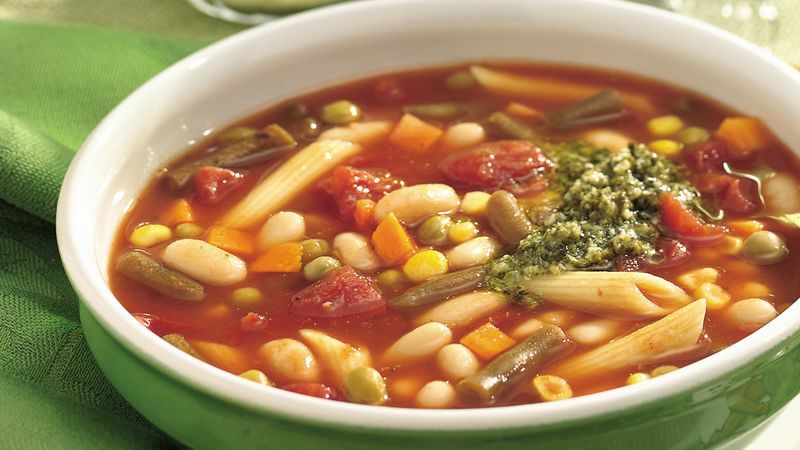 In 3 to 4-quart slow cooker, combine all ingredients except penne and pesto; mix well. About 20 minutes before serving, stir penne into soup. Increase heat setting to High; cover and cook an additional 15 to 20 minutes or until penne is tender. To serve, top individual servings with 2 teaspoons pesto. Acidic ingredients such as tomatoes and vegetable juice keep vegetables from softening too much during all-day simmering. A garnish of bright green pesto freshens each serving of long-cooked soup. Great northern beans can be used in place of the cannellini beans. The can sizes will vary but, in this soup, those differences won't matter. Don't be fooled into adding more pasta; 1/2 cup looks skimpy when you stir it in, but as it cooks it swells into the right proportion for the soup.